Somehow we were all ready to go much earlier than usual this morning, so we decided to have a family breakfast at IHOP. Blake and Ava got their usual, the Make-A-Face Pancake. 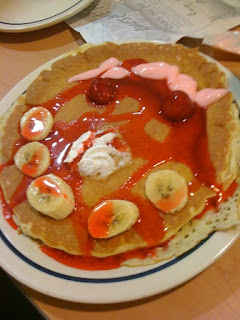 This isn't the Silly Face Pancake that comes with a pre-made face of whipped cream, chocolate chips, and cherries. This is the one that comes with a banana smile, strawberry eyes, whipped cream nose, and a tube of yogurt for you to fill in any details. Blake gave his some yogurt hair, eagerly reached for the strawberry syrup, and delivered a totally Bronson-esque "It's breakfast time!" before doing this to his pancake. "Look, Daddy. He's dead. I'm gonna eat him." Charles Bronson? Which would be awesome. Or Tom Hardy as infamous British criminal "Bronson," which would make me an everlasting member of the Blake Holwerda Fan Club. As if I weren't already.